Planning to Make Your School Green? “Aimed toward educators and school administrators, this chapter provides a broad overview of design issues related to sustainability. It proffers concrete examples drawn from Virginia Beach City Public Schools (VBCPS) to enhance performance at the level of the building, classroom, district, and region. VBCPS’s environmental approach integrates educational planning with facilities planning. Its facilities department has been driving change in school design, classroom pedagogy, purchasing, transportation, and even regional design standards. 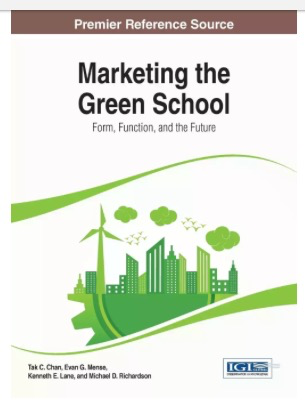 In this chapter, we provide rationale and theoretical underpinnings for green school design, and we share successful practices developed by VBCPS. Knowledge in the realm of environmental design and education is continually evolving. As such, any list of “best practices” is in constant flux. In writing this chapter, we seek to provide a description of some of the best practices we have discovered and/or created up to this point in time. Most environmentalists have adopted the World Commission on Environment and Development’s (1987) definition of sustainable development as that which “meets the needs of the present without compromising the ability of future generations to meet their own needs” (p. 43). The “green building” movement fosters new strategies to help overcome outdated construction practices that require vast material resources and cause tremendous waste and pollution. Today, North America’s over-reliance on cheap energy has reached crisis proportions (Steffen, 2008; Wackernagel & Rees, 1996). All told, buildings consume 65% of the electric power used in the United States (Landsmark, 2008). They use 36% of all energy used and 30% of all raw materials. Buildings are responsible for half of greenhouse emissions from the US (Gifford, n.d.; Udall & Schendler, 2005). Educational facilities have been among the worst, although higher education buildings seem to waste more energy than K-12 because control systems are looser (Leslie & Fretwell, 1996).